Lusty 36 began their rise to Salem fame as the Lusty 36 Balloon Boys, a name apparently given out by a Beavis And Butthead name your band type thing. Matt and Ryan already had some songs worked up when they approached Erick Alley about playing the bass, most likely since he was known for his keen sense of fashion as well as owning both a bass and bass amp. The full name stuck long enough for them to use it at their 1st show, a house party at friend Sydney’s house, headlining above future Sly labelmates, The CIA. 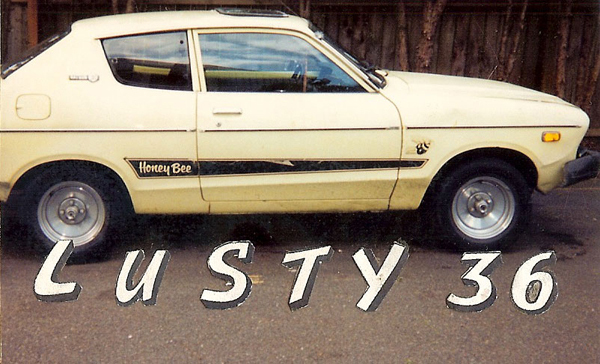 After that show the band shortened their name to simply Lusty 36 and proceeded to open numerous shows at Salem’s then thriving Grand Theater, at one time opening up for the Cherry Poppin’ Daddies among others. The Salem fame that I referenced earlier alludes to the fact that kids younger then us use to wear Lusty 36 t-shirts to school, which meant they were big time. At some point in 1996 the boys headed up to Portland and recorded an 8 song cassette with Mike Lastra, one of those songs, “Tokin’ With Tony Locker,” later finding its way to Sly’s 1st release. The band eventually dissolved as a result of growing tension with drummer Ryan Seath, whose growing personal beliefs regarding the white race did not jive with the rest of the band.